Authored by American metal journalist David E. Gehlke, the book features cover art by VOIVOD drummer Michel "Away" Langevin, and a foreword penned by BLIND GUARDIAN vocalist Hansi Kürsch. The book's inner design was handled by EasyRabbit CreArtions, the team behind HELLOWEEN's 2015 career-spanning "Hellbook". 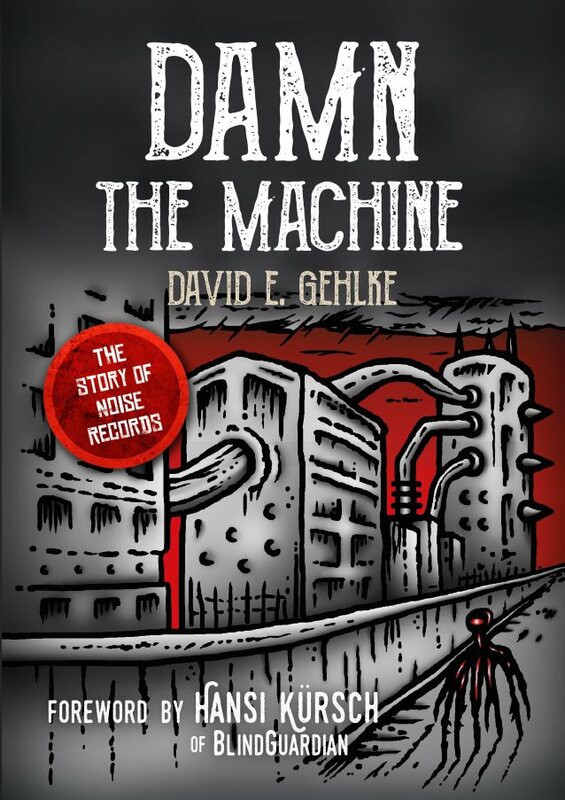 At over 500 pages, "Damn The Machine" tackles the complicated history of Germany's Noise Records, one of the most influential European independent heavy metal record companies of the 1980s. The creation of Karl-Ulrich Walterbach, Noise was responsible for signing and developing the likes of HELLHAMMER/CELTIC FROST, CORONER, GAMMA RAY, GRAVE DIGGER, HELLOWEEN, KAMELOT, KREATOR, RAGE, RUNNING WILD, SKYCLAD, TANKARD, and many more, assembling a roster whose impact reverberates throughout the metal scene today. For the first time, Walterbach goes into elaborate detail on his experiences in the music industry. A self-proclaimed anarchist with no musical background to speak of, Walterbach rose from the violent Berlin punk rock scene to the forefront of European metal after launching Noise in 1983. Walterbach's gut instinct for signing new talent made him one of metal's first true label impresarios, but his abrasive personality and unwillingness to conform to industry standards made him an outsider in a business he grew to despise. "Damn The Machine" takes the reader through Walterbach's early days of getting Noise off the ground, as the metal scene rallied around black/death metal progenitors CELTIC FROST, power metal torchbearers HELLOWEEN, and Teutonic thrash upstarts KREATOR. The book chronicles Walterbach's A&R triumphs and failures, frustrating experiences with the era's major labels, and the social climate of running a record company stationed 15 minutes away from the Berlin Wall. And, it contains Walterbach's no-holds-barred commentary on the bands and industry counterparts he did business with during his time running Noise until 2001. However, a one-sided book this is not. HELLHAMMER/CELTIC FROST leader Tom G. Warrior and his bandmates reflect on their humble Swiss countryside beginnings, where they worked diligently to change the face of underground extreme metal. Yet even though CELTIC FROST was Noise's first breakout band, they were met with regular opposition from Walterbach. The band and label's relationship deteriorated during the making of 1987's legendary "Into The Pandemonium", leading to one of metal's most controversial albums, the following year's hair metal-inspired "Cold Lake". HELLOWEEN's Kai Hansen, Michael Kiske and Michael Weikath detail the band's meteoric rise with the twin "Keeper Of The Seven Keys" (Part I and II) albums. The combination of the band's speedy tempos, Kiske's stratospheric voice, and an upbeat, positive sense of humor quickly made HELLOWEEN the highest-selling Noise act. However, the 1988 exit of Hansen along with the arrival of IRON MAIDEN's Sanctuary Management put Walterbach on the defense as he engaged in a grueling court case with EMI Records over the rights to the band. Both HELLOWEEN and Noise were never the same. "Damn The Machine" also breaks down the unlikely success of pirate metal outfit RUNNING WILD, whose creative use of swashbuckling imagery earned them a devoted fanbase across continental Europe. It profiles the unstoppable work ethic of KREATOR's Mille Petrozza, who took his band out of the rough coal mining area of Essen and into the heart of the German thrash metal movement. GRAVE DIGGER's Chris Boltendahl and Walterbach debate the band's controversial name change to DIGGER for 1986's "Stronger Than Ever", an album that immediately destroyed the band's career, while RAGE mainman Peter "Peavy" Wagner gets to the bottom of why the band was never a priority for the label in spite of their solid standing among critics and fans. Furthermore, the book demonstrates how deep Noise's roster was throughout the '80s and '90s. It captures the lovable beer metal antics of TANKARD, the rap metal explorations of MORDRED, intrepid thrash leanings of CORONER, SABBAT, VOIVOD and WATCHTOWER, as well as the pioneering folk metal blend of SKYCLAD, and melodic metal mastery of GAMMA RAY, KAMELOT and STRATOVARIUS. With over 75 exclusive interviews from every main Noise band member, manager, and industry personality, along with countless never-before-seen photos, "Damn The Machine" provides a thorough, balanced look into a record company that helped establish mainland Europe as a global force in metal. Affordably priced at $24.95, "Damn The Machine" is a must-have for legions of metal fans worldwide. The book can be pre-ordered at this location.